Let us make your custom lifter today! 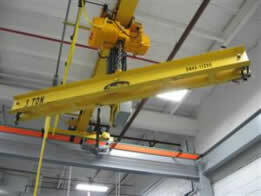 Below hook lifting devices and end effectors are used to attach loads to overhead hoisting equipment. 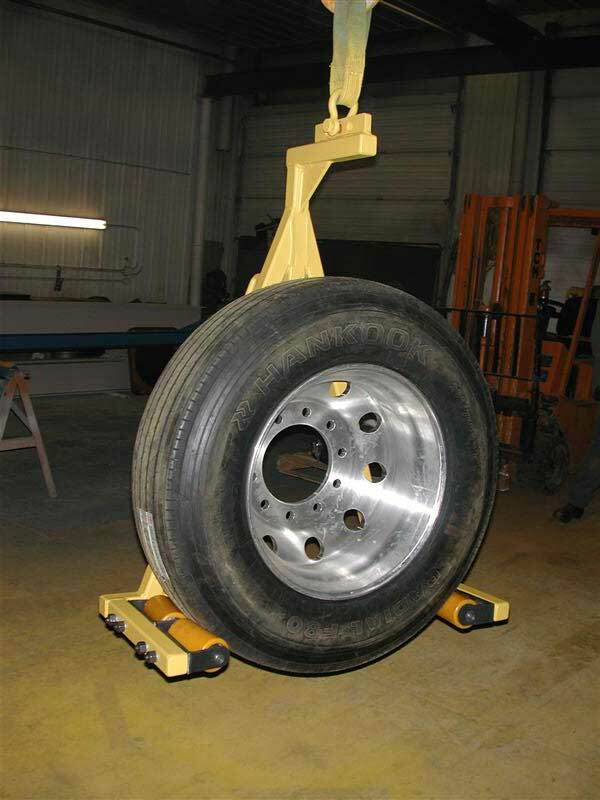 They are used to move any item that does not have a lifting lug or a place to attach a single host hook to the load. They are commonly used in following applications plate handling, pipe lifting, stone cutting, glass handling, steel handling, drum handling, and odd shaped loads. You must know the combined weight of the load being rigged and the rigging itself. The hoist must be in good working order. The capacity of the hoist needs to be more than the weight of the load and rigging equipment combined. You must insure that you have the correct lifting device for your application and that it is used in the correct way. 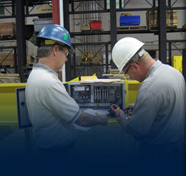 All rigging equipment should be inspected prior to use. 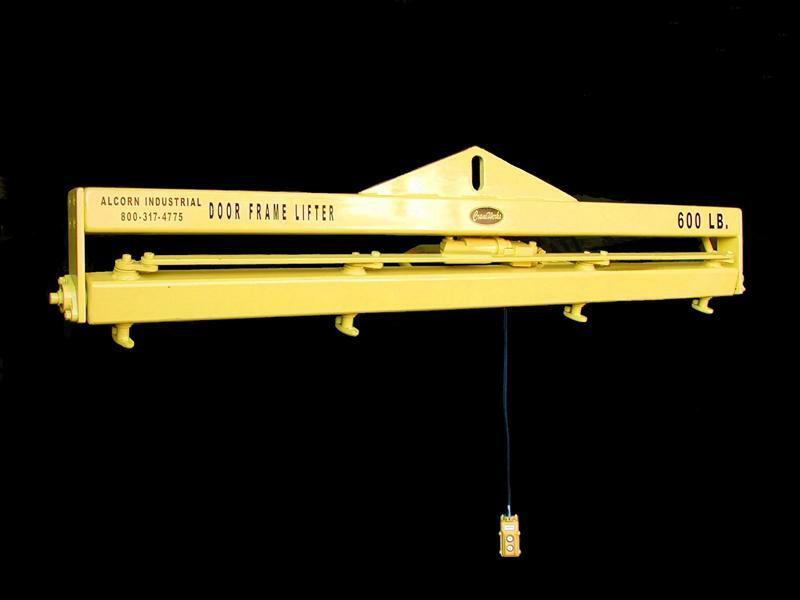 The difference between a below hook lifter and an end effecter is that a below hook lifter normally attaches to a crane or a hoist hook. An end effecter is a lifting device that attaches directly to the arm of a manipulator or a manipulator control. 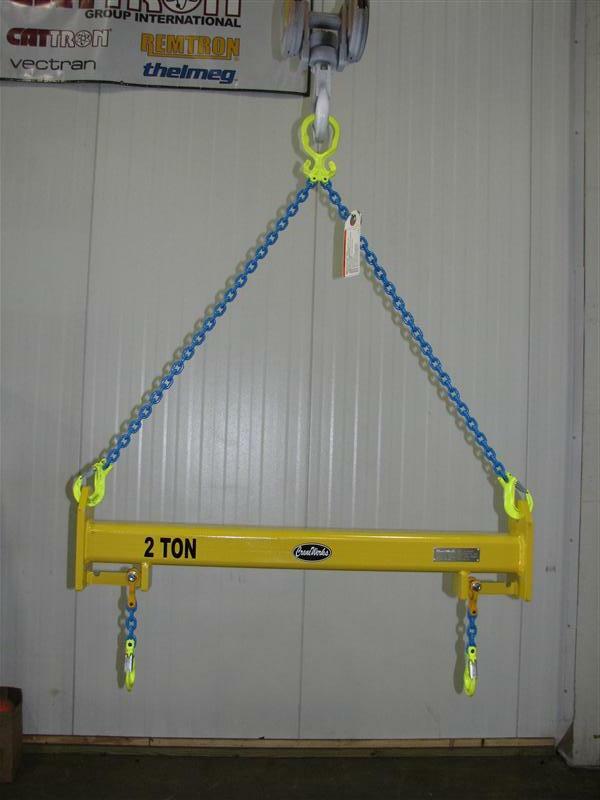 CraneWerks can help you with your bellow hook lifting apparatus needs. We offer chain and nylon web rigging that is load rated in many configurations to satisfy most any need. 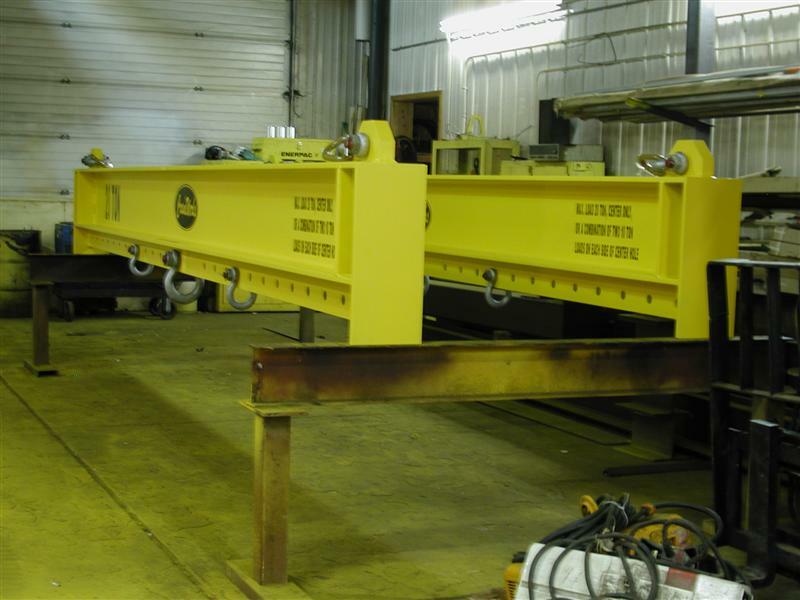 We also carry a variety of spreader beams, roll lifters, coil lifters, sheet lifters, pallet lifters and other custom devices. No crane job is complete until a plan for the proper rigging attachments have been considered. Many times this is the hardest part of many projects. 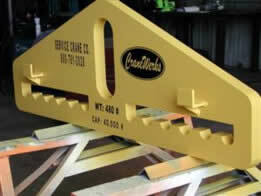 CraneWerks can design a custom lifter or end effecter to pick up your specific part. 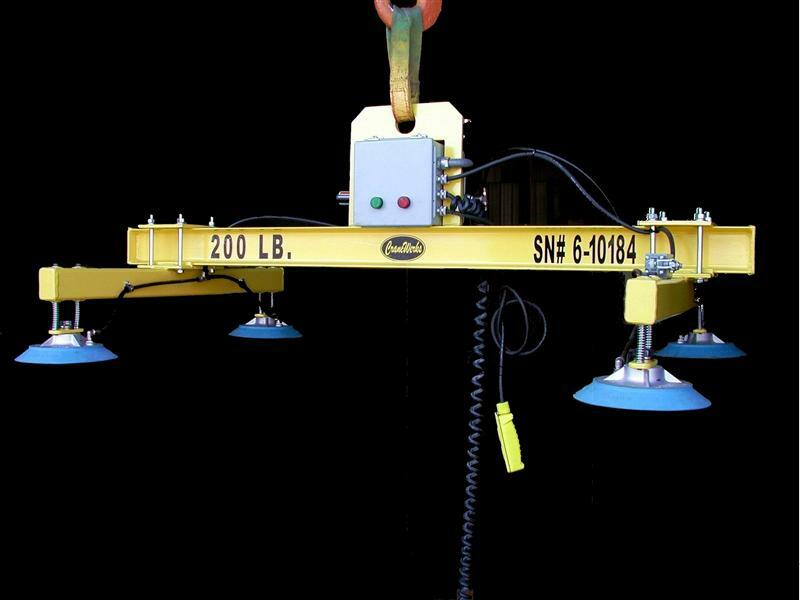 Contact CraneWerks today for more information on below hook devices and end effectors. 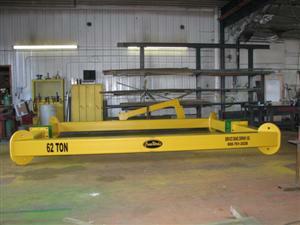 Send us information about your application and we’ll work with you to come up with a lifting solution. 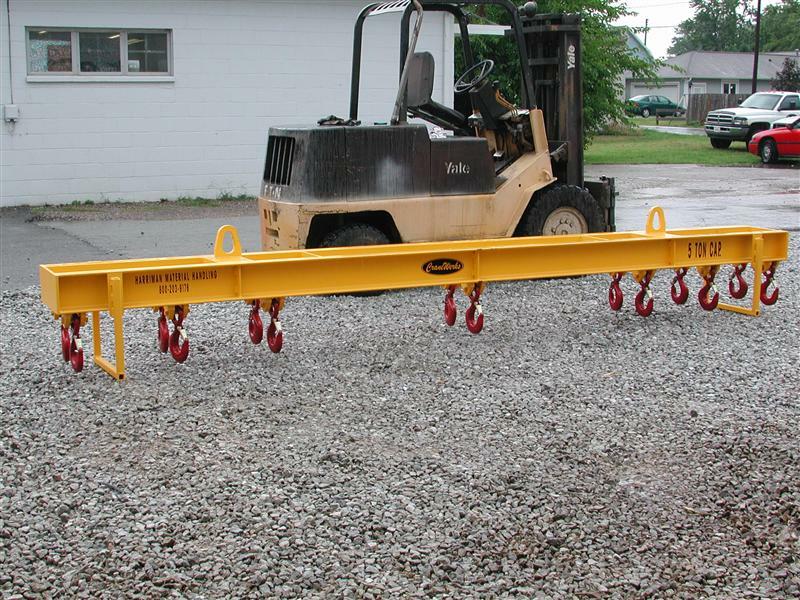 Custom spreader bar with two bails and multiple lifting hooks. Also includes build in stand.